Haunted House is an epic fantasy supplement for the Pathfinder Roleplaying Game, written by Alexander Augunas and published by Raging Swan Press. Prepare Quicker, Prepare Better. 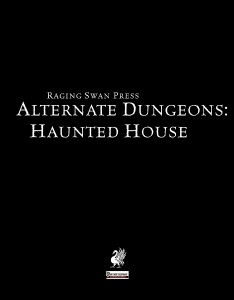 This is the mantra for Raging Swan Press, and for a product like Alternate Dungeons: Haunted House, it rings true. Alternate Dungeons: Haunted House is exactly what you think it should be and a bit more. This 12 page product is actually an amalgamation of several other types of Raging Swan products. It is broken down into a description of the haunted house as an alternate dungeon, haunted house dressings, the denizens that inhabit haunted houses, some of the traps and hazards one might encounter in a haunted house and adventure hooks for haunted houses. That is a lot of crunch for $2.45 USD. The cover is really basic, black with white writing, the font is crisp and easy to read and the Raging Swan emblem right above the Pathfinder emblem lets you know what system it was designed for. Even with the Pathfinder moniker, this product will work for most systems with very few adjustments. There are a few black and white illustrations in the corners of some of the pages with varying levels of effectiveness. This setup allows a GM to prepare quicker and prepare better. Anyone who runs games knows that quicker and better are a win/win for everyone involved in a game. Creighton Broadhurst is savvy. He knows how to frame a product like this and in the first part of this product does not shy away from addressing some of the difficulties that a haunted house setting presents for the Game Master. 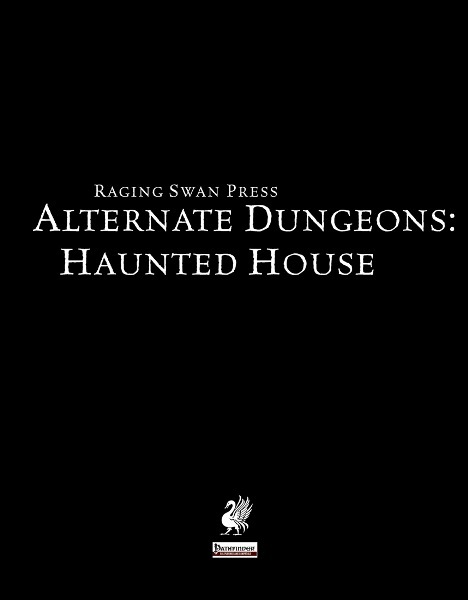 After the introduction, the haunted house as an alternate dungeon is broken down into Defining the Dungeon, Running the Dungeon and sacking the dungeon. Each of these sections contains at least five paragraphs that elaborate on those concepts. This provides a svelte outline that mentally gets the GM warmed up. After going through this section I had no less than 10 great ideas for the next haunted house I run. The dressing section is the standard D100 listing that Raging Swan has done so well for so long. This section transcends the boundaries of just being a D100 random loot list by describing how and where some of these dressings might appear in said haunted house. Some of the D100 offerings were meh, some of them were really solid and a few freaked me out. I know the meh needs to be there, but I could always do with more entries that freaked me out. The great thing is that above using the dressing chart as random room filler, there are some seeds for some great adventure hooks. The Denizens section contained exactly what I expected it to; there was a delightfully creepy picture on page 6 that really helped set the mood. As expected, the Denizens included the old standbys like shadows, ghosts, poltergeists and vampires. Rather than including the stats for these types of creature, a challenge rating and a small write up are included in the text. From a quicker preparation standpoint I would have loved some quick stat blocks, but there are really so many types of these nasties that I can see why they didn’t go there. The traps and hazards section follows the Denizens section, but has the added bonus of including some new haunts. The new haunts are a short stat entry but they have enough info for a GM to quickly add them into their haunted house, creating more of a one stop shop feel. These new haunts include Anguish, Dancing Décor and Slamming Door. The names alone ooze with insidious ways to challenge players. The last section covers Adventure Hooks but actually the book is full of them, these just happen to be spelled out in plain sight and have a slightly longer description. Most of these hooks are based on the history of the haunted location, which is normally why a location ends up haunted. The three hooks given here are interesting, but not ground breaking. Any one of them would be a great foundation to build your haunted house upon. With the spooky season coming fast upon us, this is the perfect product. If you tend to run seasonal games with you group, this product becomes an even better value. There is no requirement that states you can only run a haunted house type dungeon in October. This is a great way to change things up a bit and widen to locations where your players can slay monsters, collect loot and have one heck of a good time.